AMERICAN DREAM August 2018 • SHOPPING CENTER BUSINESS • 49 and north of Hialeah in the northwest part of the county where Interstate 75, Florida Turnpike's Extension and Mi- ami Gardens Drive converge. Miami-Dade County has been a hotbed of retail development activity recently. As of the end of the second quarter, there is nearly 2 million square feet of retail construction underway in the county, according to Colliers In- ternational. There is clearly sufficient demand as the county has maintained sub 4 percent vacancy since 2014. Although situated within Mi- ami-Dade County, American Dream Miami is seen as a transformative project for the entire South Florida re- gion. Broward and Palm Beach coun- ties are also experiencing increased investment and development activity, helping establish South Florida as an overall desirable market. "It's certainly a regional project," says Krasnow. "It's symbolic of the re- gion's transformation, but it's the not the only one. Over the next 10 years, submarkets that weren't considered core locations are going to be recog- nized as key parts of South Florida. Most of the available land within the major tri-county area will be spoken for and developed." AN UNTRADITIONAL APPROACH Triple Five is currently building the prototype American Dream project in metropolitan New York. Set to open in 2019, the 4.5 million-square-foot mall will have a ratio of 55 percent entertainment tenants to 45 percent retail and restaurants. While it's still too early to tell if American Dream Miami will uphold that ratio, Triple Five is putting a heavy emphasis on entertainment. In addition to traditional options like a movie theater, preliminary plans for the project include truly dreamlike features such as an indoor snow ski park and a lake for submarine rides. "People want to be active and stim- ulated. That's what American Dream Miami will be able to offer them," says Krasnow. An indoor ice skate rink, indoor waterpark and an aquarium are also in play for the project, in addition to traditional retail and restaurant ten- ants. No tenants have been announced as of this writing. 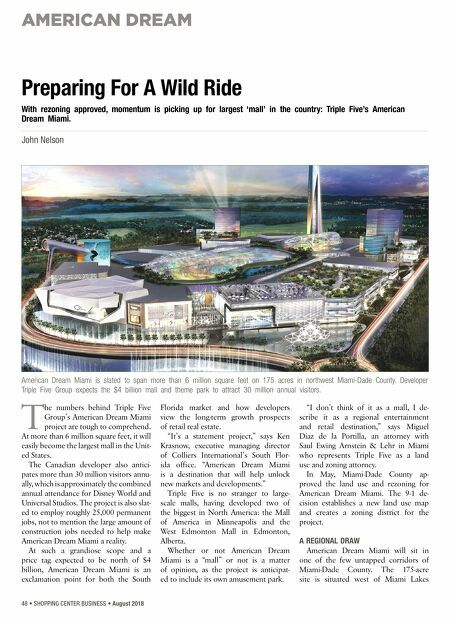 American Dream Miami will be a destination that visitors will be able to enjoy regardless of weather, pro- viding an alternative for residents and tourists outside of beaches or outdoor activities like fishing and golf. "American Dream Miami speaks to the bigger trend that we're starting to see — more experiences surrounding retail," says Krasnow. "That's going to be a driving component of this proj- ect that is needed in the area." STILL WORK TO BE DONE Triple Five has not released a con- struction timeline for American Dream Miami because of how early it is in the approvals process with Miami-Dade County. Miami-Dade County approved zon- ing and land use changes for the site, which was previously zoned for in- dustrial space. But before Triple Five can start construction there are several steps to complete. Triple Five must submit for Admin- istrative Site Plan Approval (ASPA), which is the plan that depicts the overall layout of the site, landscaping, building elevations and parking areas. County agencies will review the ASPA, which must be consistent with the De- velopment Agreement that the county commissioners approved in May. Triple Five also needs to have its water management plan reviewed and approved. The water management plan is a detailed account of how de- velopers plan to manage storm water and any wetlands through the use of irrigation, landscaping and plumbing. Triple Five will also need to begin the platting process, which includes establishing the legal boundaries of the project and getting the paving and drainage plan approved for the roadways. As part of the development agreement, Triple Five will dedicate $210 million for roads and inter- change improvements. Once the ASPA and water manage- ment plans are approved and portions of the platting process are underway, Triple Five will be able to submit for building permits to break ground. Once those are issued, Triple Five will pay its impact fees, which are estimat- ed at $60 million. "We look forward to the next step of this comprehensive application pro- cess and building an entertainment destination with attractions for fam- ilies to enjoy and our community to be proud of," says de la Portilla on behalf of Triple Five. 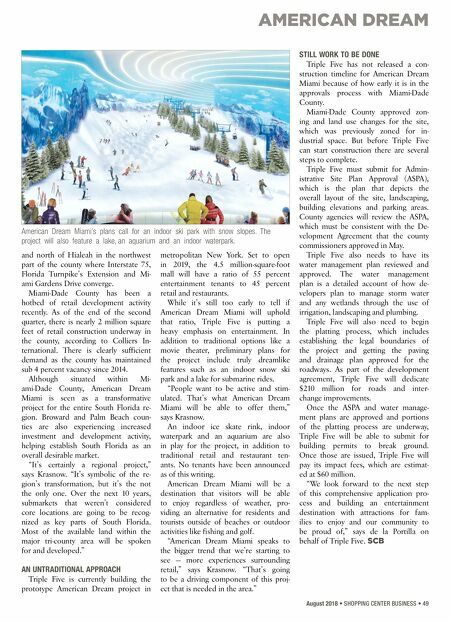 SCB American Dream Miami's plans call for an indoor ski park with snow slopes. The project will also feature a lake, an aquarium and an indoor waterpark.